Browser game Legends of Honor (legendsofhonor.com) from Goodgame Studios takes commanders into a glorious medieval world where only one thing matters: living and dying for the honor of your faction. The game is all about heroes and their armies, which must be developed and led into battles against other factions and sinister marauders. The interactive world map lets players carry out actions in the style of a real-time strategy game. The dynamic battle system and ongoing fortress expansions keep aspiring castle lords constantly engaged. The Legends of Honor game world stands out due to its fast gameplay and features, guaranteeing long-lasting fun. After completing the short tutorial, aspiring commanders choose what faction they want to go to war for. Players can choose freely from the Order of the Golden Claw, the Knights of Ash and Shadow, and the Warriors of the Wild Lands. The player’s faction determines which alliances they can later join. Alliances are an essential component of Legends of Honor. They let players coordinate attack and defense strategies with other commanders and trade resources with each other. As the game’s name suggests, honor is one of the key resources that commanders can earn in battles. The more honor a player collects, the mightier honor ranks and units they will unlock. Nonetheless, players should proceed with caution. If they get lazy or attack considerably weaker opponents, they will also lose honor points. If a player decides to leave their faction, they will forfeit all of their honor. Heroes assist the player in winning battles on their path to becoming a legend. At first, players only have one hero to lead their armies. Over the course of the game, more heroes join the fight. In the style of the role-playing genre, it pays off to increase the power of your heroes through battles and equipment as they become available. The heroes can award troops various bonuses that play a key role in victory and defeat. The troop formations consist of a multitude of battle units and unit boosters that the player can improve continuously. Besides battling other players in their castles or on the world map, players also have to destroy NPC marauders. The battle system impresses players with its fast actions due to short planning times. The special highlight of the tactical battle system is the interactive world map where heroes can move about freely. The terrain type influences armies in battle. For example, some units are good at attacking in the forest but are poor at defending themselves there. For this reason, commanders must always carefully consider where to place their units and ensure that the different types complement each other perfectly. Over the course of the game, two new kingdoms can be unlocked, which contain not only an additional world map and castle, but also new quests and resources. 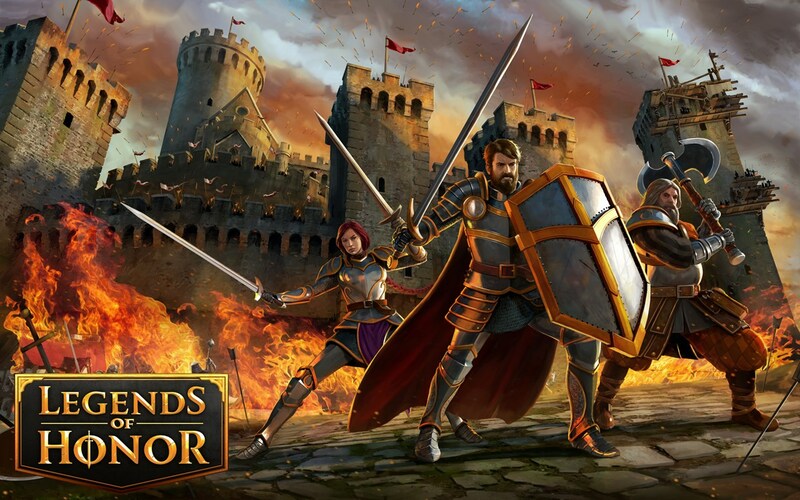 Legends of Honor also offers players new challenges through upgrading fortresses and managing a total of six different resources. Especially active castle lords are given a resource clicker so their untiring fingers can ensure that wood and stone never run short. Legends of Honor can be played worldwide and will be released in 20 languages.